I am loving being in full BBQ season and have been cooking a whole array of different dishes. I thought I’d start our BBQ special with a simple but delicious dish of spicy marinated king prawn skewers. Place the prawns in a bowl and add all the ingredients and mix together with your hands. Cover the bowl with tin foil or cling film and place in fridge for a couple of hours. 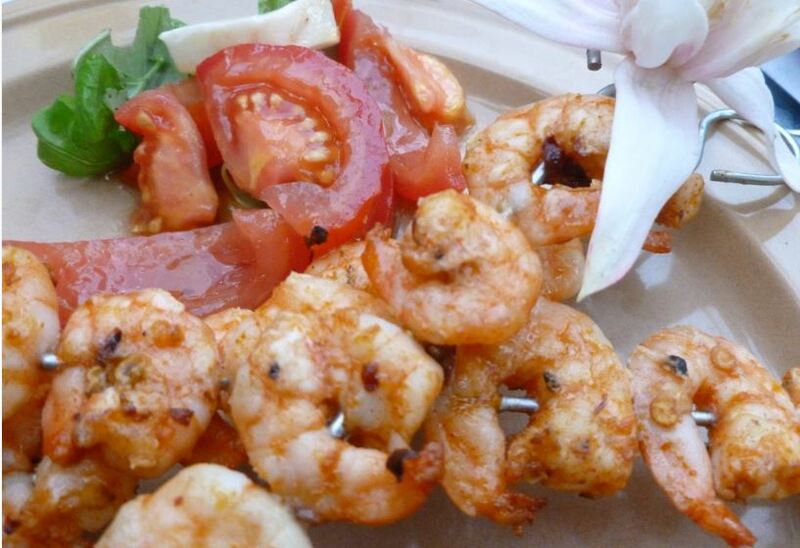 Whilst your BBQ is heating up add 6 prawns to each skewer. Place prawns on BBQ a hot, a couple of minutes on each side. A nice fresh tomato and mozzarella salad is always great with these. This is a nice and simple dish that will leave all your guests wanting more. My colleague Sarah is married to a Cuban man and has become a pro at Cuban cooking. I am always eyeing up her food and sometimes even get a donation towards my lunch club with Claire. This chicken dish is my take on Sarah’s fried chicken except I cook it in the oven. In a sandwich bag (or bowl) add your chicken, thinly sliced onions and the ingredients (except the oil). This is a bit messy but get your hand in the bag and make sure all the ingredients are mixed together. Close up your sandwich bag (better to place the bag in a bowl) and leave it in the fridge for 20mins – though the longer the better. Preheat your oven to 200C. Empty all the contents of the bag in an oven dish and pour a little oil over the chicken making sure the onions are covered in oil (you really don’t need to use much). Put the chicken in the oven and after 15mins check that the onions aren’t burning. If they are starting to, stir them a little and leave to cook for a further 15mins. I had a big salad with the chicken, but there was some left so I brought it to work for my lunch club. Claire had some left-over pasta and they went perfectly together. For Sarah’s chicken, she lets it marinate for 24 hours (I think) and fries the thighs in oil. Either way is yummy. I came home after work to nothing in the fridge 😦 and I really didn’t feel like going food shopping. Thankfully I had some mince in the freezer and an onion, so I thought I’d make some meatballs and I got a thumbs up from my lunch club at work when I brought the left-overs in, I always use this as my thermometer of success. I didn’t have any fresh tomatoes, only canned ones so I thought I’d try adding cumin to give my sauce a bit more flavour. In a bowl put you mince and add to it chopped garlic, chilli flakes, thyme, salt and pepper and massage together. You can also add an egg, but I didn’t have one and it worked fine without. Make small balls of meat (you can make them the size you want), I made them about the size of brussel sprouts. In a sauce pan heat your oil and add the onions, after 1 minute add the cumin, stock cube, soy sauce, sugar, tyme and salt and pepper. Stir ingredients and once it comes to boil add the meatballs, cook for 5 minutes and then turn the heat down and let it simmer for another 15 minutes. Serve with spaghetti. 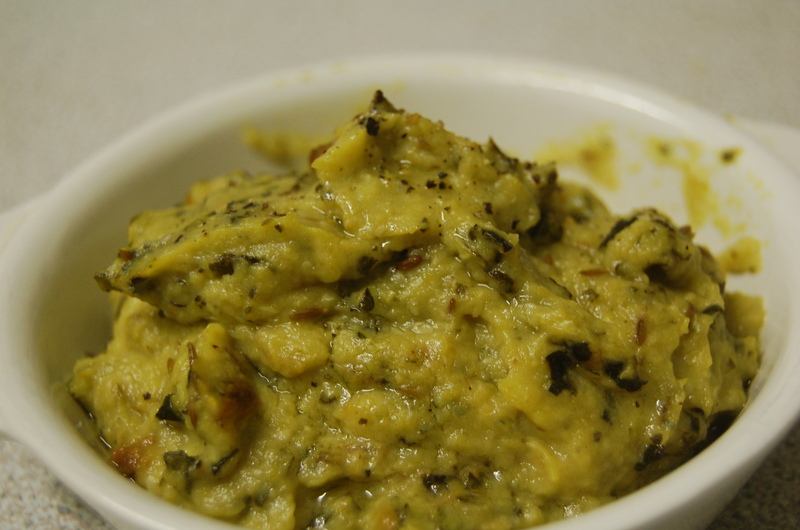 This is a simple dip that goes well with nachos or as a side dish with fish or meat. Turn the oven on to 200c. Cut the courgettes into slices and put in an oven proof dish, sprinkle cumin seeds, the garlic cut in halves, salt and pepper. Add about three tablespoons of olive oil, make sure it coats all the ingredients. Put the dish in the oven for about 30mins, stir the courgettes every 10 mins. Once cooked remove from the oven, put into a food blender and add the lemon juice. Blend all the ingredients for a few seconds. You can also do this with aubergines.